Come on down for the usual Aberboomtique vibes along with some psydub, downtempo, glitch-hop, reggae/dub, balkan beats, jungle and drum&bass. We will also have the usual array of poi, fire spinning performers both inside and out of the venue along with stalls selling various items. 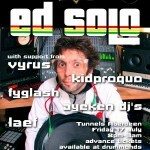 Ed Solo is one of the finest engineers/producers in the dance music business. He honed his skills as a junglist before ducking and diving through every style of broken beat going – his stamp on electronc music runs as deep as his subs. It started in London where Ed cuts his teeth at the controls in the mid nineties by engineering Black Twang, Elizibeth Troy & Roots Manuva before laying down groundbreaking collaborations with jungle kingpin DJ Brockie including ‘Represents’ and ‘Echo Box’. 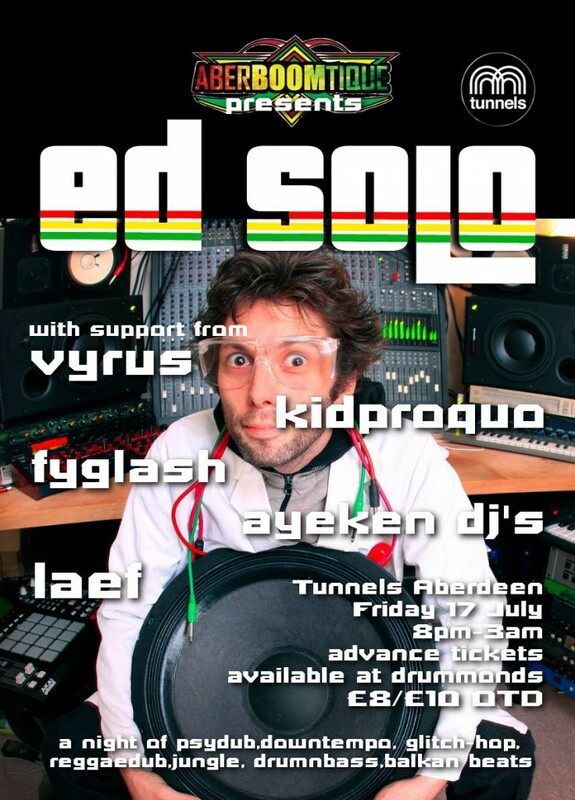 Next was Brighton and into a studio above Krafty Kuts record shop where Ed produced many seminal Breakbeat tracks which led to 2007s timeless album ‘Random Acts of Kindness’ alongside Skool of Thought and Darrisson. The album dropped a systematic stream of blazing tracks including ‘When I Was A Yout’, ‘We Play The Music’ and ‘Love Your Life’ and this work cemented him as a worldwide household name. Since then Ed has enjoyed making a wide range of styles but he’s best known for his own crowd pleasing Reggae Drum & Bass tracks from remixing Chronixx to Sizzla to original recordings with Elijah and StickyBudz.